c.a.pasi is based in Italy and have been selling on eBay since 2010. They have earned more than three thousand positive feedback ratings, with a current 99.9% positive overall score. They are also recognized as one of the Top Rated sellers globally and in the UK. Sellers with the best customer service and fast shipping are rewarded by eBay through the Top Rated Seller program. They run a store called CAPASI. They rank 74,451st overall. They have improved from the 100,000,000th position last month. Seller rank is based on the number of positive reviews received during the last 30 days. 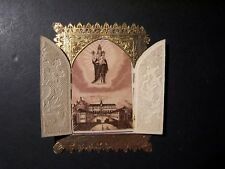 155/47) Blessed Francesco fogolla-RARE Authentic Relic. 155/31) S. Luigi Orion-Medal with relic. c.a.pasi cancellations, returns, exchanges, estimated shipping times, customs/import taxes, store policies, payment options and shipping information can be found here. Other sellers from Italy dianostores, boutiquemodascarpe, skizzobimbisrl, dauzaarstaff and angolo-degli-accessori. Browse all sellers based in Italy.